Were an individual who hails from Beaver Dam, Kentucky to take off in the world of Southern Gospel music, it wouldn’t be much of a surprise or stretch. Beaver Dam, Kentucky has always been quintessential small-town America. For years, Main Street was dotted with a local meat n’ three, the local bank and a quirky little used shoe store the locals liked to call Beatty’s. Got the picture? Now, imagine a Beaver Dam native scaling the charts, the ranks and walking away with one of the most prestigious awards in Contemporary Christian music. More likely than not, that was the reaction of several CCM fans when Jason Crabb walked with not only Male Vocalist of the Year, but Artist of the Year at the 2012 GMA Dove Awards. But, the moment he opens his mouth to unleash his powerful pipes, all doubts dissipate. And everyone else…meet one of the most talented artists this industry we call CCM has ever seen. Of course, it must be said that Jason, while only recently emerging on the CCM side of things, has been at this a long time. His family, more commonly known as The Crabb Family, has been Southern Gospel royalty for years. But, after numerous Dove and GRAMMY nods, Jason decided to forge his own path. And on his forthcoming album, Love is Stronger, his first since the Dove win, he decidedly takes a new direction, leaning heavily on industry heavyweights and even more so on the God he just can’t stop singing about. “I’m very excited for people to hear this record,” says Jason. “We’re gonna go familiar places, but also to some places I haven’t been in sonically. And with good reason…Helmed by a veritable who’s who of stellar producers, Jay DeMarcus (Rascal Flatts), Ed Cash (Chris Tomlin, tobyMac) and Wayne Haun (Celine Dion, Jessica Simpson), the album not only contains lots of styles…it contains lots of styles done really well. And while he’s not looking to abandon his loyal fan base, he’s more than ready to expand his audience. After visiting several specialists and naturalists, she is now on the back side of things and doing everything that she loves, including hitting the gym with Jason (who has recently dropped a few pounds himself). Which is what Jason does as he shares more stories behind the songs on the record. From “Give,” which “offers a sound spin on things,” shares Jason. “If you want love… forgiveness… give it,” to “That’s What the Blood is For,” that reminds us that, “we can’t be victims of our past; we let the blood cover our past and enjoy this gift of life,” it’d obvious—these songs were all labors of love. The guest artists who appear on the record — Kari Jobe, Michael English and Joyce Martin — not only add incredible texture and depth to the songs; they reveal just how Jason is revered within the industry — the kind of guy everyone wants to work with. He’s also the kind of guy who doesn’t spend time talking about himself… instead of focusing on his own talent and ability, he shifts the spotlight onto others. The same can be said for Jason. Each moment of the new album is emotive and beyond the confines of any one genre. More than the music, however, Jason is truly a man in pursuit of God’s best — committed to doing all it takes to make the most of the gifts he’s been given. 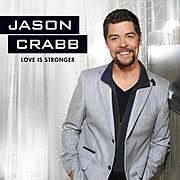 And be it a little pop, a little southern or a little country, the truth of God’s love resonates most strongly of all to an audience who won’t soon forget the voice and the heart of Jason Crabb.